Just in time for the holidays, NASA’s Curiosity rover is celebrating Christmas 2015 at a Red Planet Paradise – spectacular “Namib Dune.” And she marked the occasion by snapping her first ever color self-portrait with the mast mounted high resolution Mastcam 34 mm camera. Heretofore Curiosity has taken color self portraits with the MAHLI camera mounted at the end of the 7-foot-long (2-meter-long) robotic arm, and black and white self portraits with the mast mounted navcam camera. The new Mastcam color self portrait was taken just days ago on December 19, and includes the first ever color images of the rover deck. Previously, Curiosity has used the Mastcam color camera to take tens of thousands of exquisite high resolution panoramic images of the magnificent looking Martian terrain, but not the entire rover deck which includes the inlet ports for the pair of chemistry labs in the robots belly. 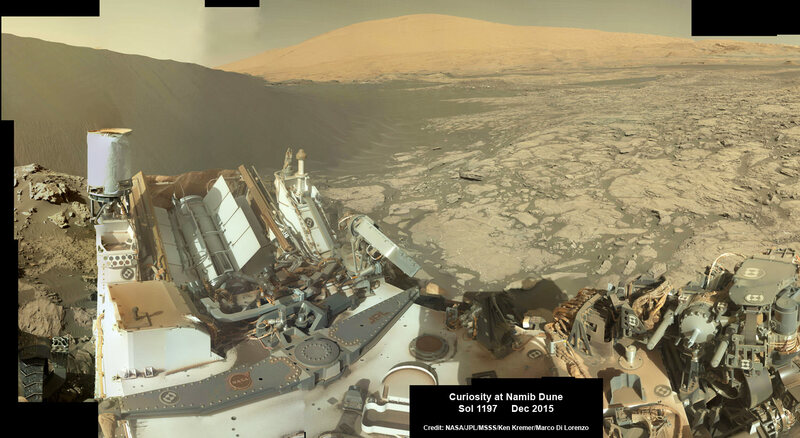 Curiosity arrived at the outskirts of Namib Dune in mid-December. And as the images show Namib Dune is humongous and unlike anything encountered before by Curiosity. See our exclusive photo mosaics above and below from the image processing team of Ken Kremer and Marco Di Lorenzo. Why snap a Mastcam self portrait now? Because there’s unique science to be gained from the Red Planets swirling winds whipping up dust and sand particles with the rover now at the edge of the giant dune field at the foothills of Mount Sharp, and to check for buildup of particles on the rover deck. “The plan includes a Mastcam image of the rover deck to monitor the movement of particles,” wrote MSL science team member Lauren Edgar, Research Geologist at the USGS Astrogeology Science Center, in a mission update. Namib Dune is part of a massive field of spectacular rippled dark sand dunes, known as the “Bagnold Dunes” – located at the base of Mount Sharp and range up to two stories tall. The six wheeled rover was dispatched to the dunes to conduct humanity’s first up-close investigation of currently active sand dunes anywhere beyond Earth. “Namib is an Aeolian paradise,” wrote Edgar. This past week, the science and engineering team commanded the car sized rover to drive closer and around Namib to investigate the dune from various angles with her state of the art science instrument suite. Curiosity arrived at the lee face of Namib Dune on December 19, or Sol 1197. The dark dunes skirt the northwestern flank of Mount Sharp and lie on the alien road of Curiosity’s daring trek up the lower portion of the layered Martian mountain. Beside dunes, the local terrain is also replete with a bonanza of outcrops of bedrock and mineral veins for targeted science observations. Initial imaging results are already promising and much more is upcoming. “The Mastcam images that we took earlier this week are coming down now, and they reveal a lot of great details about the dune morphology,” says Edgar. “Mastcam will do a mosaic of the slip face of Namib dune, and a stereo observation of the target “Nadas” to study the shape of the alcoves on the very crest of the dune,” MSL team member Ryan Anderson added. While Earthlings and their families are gathering together and engrossed in the Christmas holiday cheer, there will be little rest for ‘The Martian’ Curiosity. The science team has planned out and uploaded more than a week of science observations to run through the New Year’s holiday. “We’re in a great location to study “Namib Dune” so there is plenty of good science to be done,” says Anderson. As of today, Sol 1203, December 25, 2015, Curiosity has driven over 7 miles (11.5 kilometers) and taken over 291,700 amazing images. Merry Christmas back at you Curiosity. May you work for many years to come! That first image explains so much! In an earlier release, the nearby dunes looked HUGE but without a perspective to actual size. This shot puts a more distinguishing scale on the dunes and shows how tall they actually are, at least along the boundary. Previous PostPrevious Nebulae: What Are They And Where Do They Come From?